What a week. TrumpCare goes down to defeat. Trump’s new communications director nicknamed “Mooch” spews profanity. The White House Chief of Staff is fired. LGBT’s are banned from the US armed forces. These are all distractions. None have any real relation to core issues troubling America’s society and economy. When distractions take center stage, distraction becomes destruction. Replace just two letters in ‘distraction’, and you get destruction! So what ARE the core issues? Americans’ consumer confidence is at a 16-year high! So Americans are spending and borrowing. Saving has fallen. That leaves fewer resources for capital formation. But America needs more saving, not more spending and more personal debt. 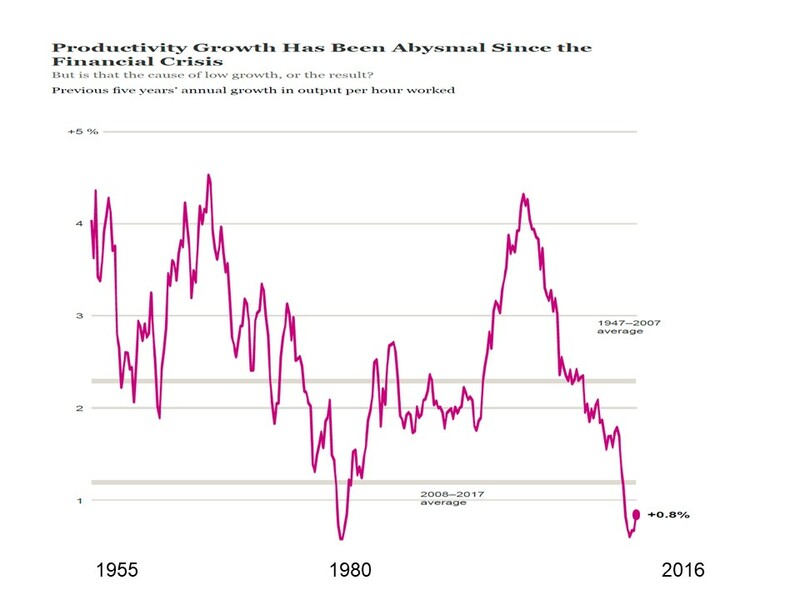 According to Neil Irwin, writing in the New York Times, productivity growth has fallen from a long-term average of 3% to less than 1%. (see graph). That is because wages haven’t risen, so it no longer pays to invest in labor-saving technology, which raises productivity. America’s infrastructure is crumbling, it has been for years, but there is no money to pay for rebuilding it. Trump’s plan is to have the private sector rebuild it. How likely is that? No Administration has been this dystopic, dysfunctional, perhaps in history. And it’s a doom loop. The more dysfunctional it is, the less good capable people are willing to join it. Who wants to board a sinking ship? Suppose America was a company whose shares were listed on the stock exchange. Would you sell them short? Many people would. The major worry is not the economy. It is this — in the coming year, it is highly likely that there will be a major, unanticipated Black Swan crisis. Could be North Korea, Iran….Mideast… who knows? What are the chances that the Trump Administration will handle it coolly, professionally, with good judgment and wisdom, in a way that benefits not only America but the whole world? Read Barbara Tuchman’s March of Folly (1985). Here is the definition of folly: “Government decisions that are against its own interests”. Can you see folly in the distractions of the Trump administration? Can you see destruction? And can we interpret the boom in consumer spending as a no-confidence vote in the future? Flight Times Cut in Half? It’s No Dream! NASA says it will begin taking bids for construction of a demo model of a plane able to reduce the sonic boom to something like the hum you’d hear inside a Mercedes-Benz on the interstate. The agency’s researchers say their design, a smaller-scale model of which was successfully tested in a wind tunnel at the end of June, should cut the six-hour flight time from New York to Los Angeles in half. NASA proposes spending $390 million over five years to build the demo plane and test it over populated areas. The first year of funding is included in President Trump’s 2018 budget proposal. The Concord, that beautiful supersonic jetliner built by France and England, now junked after a tragic accident, actually damaged the cause of supersonic flight. Supersonic planes generate shock waves that are noisy, irritating and can cause major damage on the ground. So the US banned supersonic commercial flight over land, allowing Concord to land only at east coast airports, flying supersonic only over the ocean. That ban made the Concord a technological triumph and an economic disaster, bringing big losses for British Air and Air France. Now, that may change. Bloomberg: NASA is targeting a sound level of 60 to 65 A-weighted decibels (dBa), Coen says. That’s about as loud as that luxury car on the highway or the background conversation in a busy restaurant. Peter Iosifidis [head of design] says that Lockheed’s research shows the design can maintain that sound level at commercial size and his team’s planned demo will be 94 feet long, have room for one pilot, fly as high as 55,000 feet, and run on one of the twin General Electric Co. engines that power Boeing Co.’s F/A-18 fighter jet. “Now you’re getting down to that level where, as far as approval from the general public, it would probably be something that’s acceptable,” he says. By comparison, the Concorde, that bygone icon of the Champagne-sipping, caviar-scarfing supersonic jet set, had a perceived noise level several times louder, at 90 dBa. [Note: decibels are measurement units that are logarithmic; that’s why 90 is many times 65. Same goes for the Richter scale that measures earthquakes]. 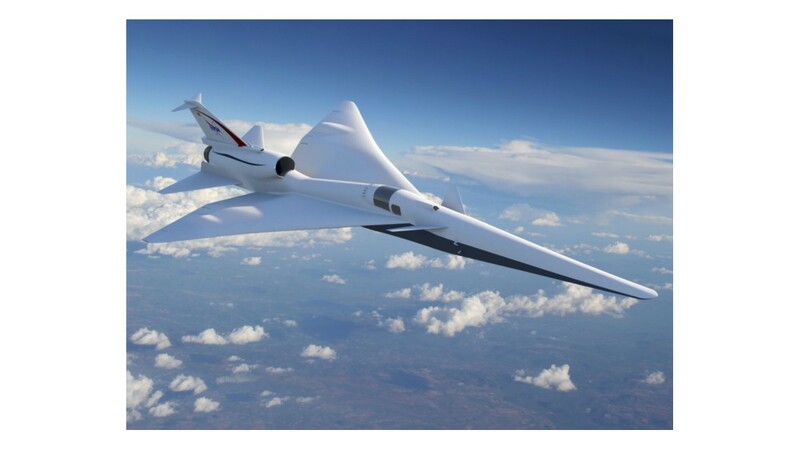 Looks like we will live to see supersonic commercial flight return big time. The business model will likely be ‘premium’ (as with Concord), for well-healed customers. But over time, the technology will as always get cheaper and trickle down to us ordinary folks. So – start calculating. That long 12-hour trip from TLV to JFK? One day it will be just six hours. Or JFK to Heathrow? 4 hours. That means you could leave JFK at midnight, get to London at 9 a.m., put in a workday, and be home for dinner (you will arrive before you leave, i.e., leave at 7 pm UK time and arrive at 6 pm New York time) because at 1,400 mph, the jetliner travels faster than the rotation of the earth). Taking Risks? Or Seizing Opportunities? “Take calculated risks.” That was what General George Patton said – and then, raced across France with his armored division, after Normandy, often well ahead of his supply lines, and entered Germany with his Third Army at the close of WWII. That mad dash across France was heavily criticized by his commanding officers. But it destabilized enemy forces and ultimately proved itself. Today’s New York Times op-ed by Arthur C. Brooks, who heads the conservative think tank American Enterprise Institute, reinforces Patton’s advice. He cites research by U. of Chicago economist Steven Levitt (author of Freakonomics). Levitt, whose research is brilliant and unconventional, found thousands of people about to make important decisions. They agreed to make the decision with a coin flip. Heads, yes, go ahead! tails, no, don’t risk it!. Levitt found that many more people were likely to “go ahead and do it, affirmatively” when left to chance, then if they decided on their own. And astonishingly, six months later, the average ‘heads’ person (yes, do it!) was happier than the average ‘tails’ person (play it safe). Brooks cites evidence that those under 30 are far less willing to relocate for job opportunities, or to start their own business, then the older generations. There is diminishing ‘frontier spirit’ and rising paranoia about taking big leaps. They are missing a great deal in life, as a result. Life is always tossing opportunities before us. Seize them. If they work out, great. If they don’t, applaud yourself for being bold enough to give it a shot. Pasteur said, chance favors the prepared mind. So – prepare your mind just to SEE opportunities – if you’re too cautious and prudent, you won’t even see them. And then, practice grabbing those opportunities. And don’t be afraid if you feel you lack the skills and knowledge the opportunity requires. You’ll acquire them. That’s a side benefit of ‘seize opportunities’ – the more you do it, the better you get at it. I was once approached by someone who wanted to fund research on a key social problem. Everyone else had turned him down. And I wasn’t much interested. But – I decided to go for it. The result: A radical systemic plan that could bail Israel, and other countries, out of a much-ignored pension crisis. I gained new knowledge, and more important, new-found relevance. I know the old cliché about risks being opportunities. It is a cliché – but it’s also true. The next time opportunity knocks, answer the door. You never know what adventure might present itself. Lately, in idle moments and hours [in this space, I always advise finding do-nothing idle time, when your thoughts float free], I’ve been thinking about how I cope with the multiple small and big problems that life always tosses at me. Despite my having a truly blessed life, it still happens that fairly minor problems prove to be major irritations – and that irritation ruins my mood, and my ability to create. Not good. Unacceptable. So, here is what I came up with, a way to solve the problem of how to solve problems. It’s about mindset. Define your challenges differently. BUT this: A challenge or problem is something that I face with restrained joy – because it is one more opportunity for me to show that I am capable, efficacious, competent, and able to solve problems with creativity and persistence. And when I succeed, I feel even more capable. And when I fail? I applaud myself for making a great effort – and look forward to the next opportunity. The definition of creativity that I use, in this space, is: “widening the range of choices”. Facing a tough problem? Widen your range of choices. There are a great many ways of dealing with really tough dilemmas. Including, just doing nothing, and living with it. 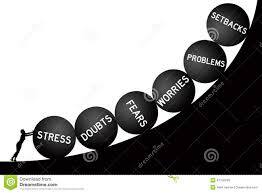 Become a startup entrepreneur each time you face a really tough problem. Tackle the problem with gusto. And then congratulate yourself – and you will soon be on a roll, becoming a first-rate gold-star Olympic champion efficacious empowered personal problem solver. Example: last September a taxi banged into the side of my car and did some serious damage. My insurance paid for the repair, but the taxi driver (with the help of his insurance company, which was also mine!) sued me in small claims court, claiming I was to blame. And the insurance company ‘kindly’ added me as a defendant! Big-time annoyance and time-waster. I decided to treat this as a challenge. Let’s see if I can help justice win one, for once. And learn what it’s like to go to court. With the help of a lawyer friend, I crafted a very careful written defense. I came to court and prepared diligently for it. The judge was very thorough and the ‘trial’ took most of the morning. My insurance company sent a representative, who brought photographs … of the wrong vehicle! That almost killed my case at the outset. But in the end the judge ruled in my favor. The taxi driver lost the morning’s fares. The ruling included the taxi driver paying me a small sum of ‘expenses’ for the court appearance. I chose to forego it; this is not about money but about justice. So what was a huge annoyance, turned into a challenge to help the justice system, while maintaining my own humanity. In a way, I shaped a kind of narrative – a way that I tell myself the story about this episode. And instead of it being painful, irritating, and annoying, it became a narrative in which …I did the right thing. Fight for justice. Retain your compassion. 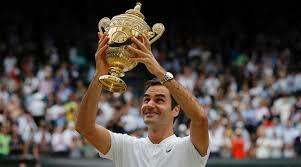 At the ripe old age of 36, Roger Federer has again won Wimbledon. Not only that – he won it without losing a single set — a feat last done decades ago by Bjorn Borg. What’s his secret? He’s happy to reveal it. From his teens, he says he was careful to take care of his body. Fitness, eating right…. Pro tennis puts enormous strain on the body, and it has to be given tender loving care except when you’re on the court, when the start-stop violence rips ligaments, tendons, muscles and everything else. This year, Federer was careful to ration the events in which he competed, pacing himself and his body. He may well regain his #1 position this year. But Chris Clarey, who covers tennis for the New York Times, reveals another Federer secret. Federer plays it safe when it is wise to do so, regarding fitness, scheduling, and lifestyle. But on court? He’s a risk-taker. “I wish we’d see more players and coaches taking chances at net [i.e., rushing to the net, and volleying], because good things happen at net, but you have to spend time up there to feel confident up there,” Federer said. At Wimbledon, Federer did ‘serve and volley’ (serve and then rush to the net) 16% of his service points – in other words one serve in six – and that doesn’t seem like much, but in fact it is more than double the 7% tournament average (i.e. servers rush the net one time out of every 14 serves]. A key point here is: You have to serve and volley a lot, to get good at it. And you might lose points initially as a result. But – take risks, stick to it – and you will win. Now, I admit – Federer has totally out-of-this-world eye-hand coordination. And this is vital at the net. But his wisdom applies to us in life. 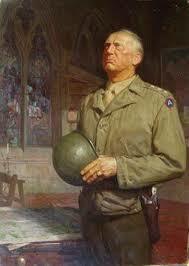 Practice taking calculated risks, as General George S. Patton once said, especially when everyone else is playing it safe. Over time, you get better at it. Nothing ventured, nothing gained. 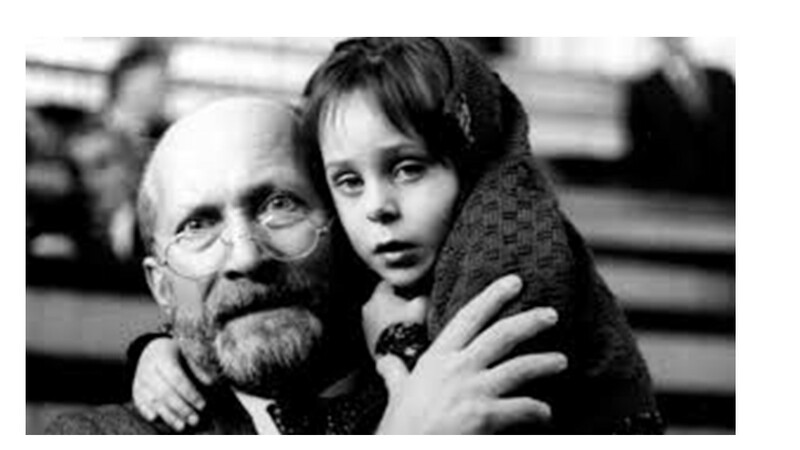 Janusz Korczak was marching, his head bent forward, holding the hand of a child, without a hat, a leather belt around his waist, and wearing high boots. A few nurses were followed by two hundred children, dressed in clean and meticulously cared for clothes, as they were being carried to the altar. ….When the group of orphans finally reached the Umschlagplatz, an SS officer recognized Korczak as the author of one of his favorite children’s books and offered to help him escape. By another version, the officer was acting officially, as the Nazi authorities had in mind some kind of “special treatment” for Korczak (some prominent Jews with international reputations were sent to Theresienstadt). Whatever the offer, Korczak once again refused. He boarded the trains with the children and was never heard from again. On my wall at work, I have a small plaque with these words written by Mr. Doctor. Perhaps they are worth sharing. Take time for work – it’s the price of success. Take time for thought – it’s the price of your power. Take time for playing – it’s the secret of your youthfulness. Take time for fraternal love – friendship with someone nearby will ensure you contribute meaningfully to others. Take time for dreaming – it will pull your soul up to the stars. Take time for making plans — then you will have time to do the other nine. Rest in peace, Mr. Doctor. I have a very personal interest in Alzheimer’s and in general age-related dementia, for two reasons. First, my own age: At 74, I am moving into the dementia-prone zone. Second, family – like nearly everyone, I have known people who suffered and are suffering from it. One in eight older Americans has Alzheimer’s disease. Alzheimer’s disease is the sixth-leading cause of death in the United States. over 15 million Americans provide unpaid care for a person with Alzheimer’s or other dementias. These figures apply equally to all societies that are aging, which is essentially all countries in the West, and even China. Today’s New York Times has an Op-Ed by Pagan Kennedy, about new breakthroughs in Alzheimer research, disastrously underfunded (8,000 research papers every day are published on cancer! Frankly, the results are meager). For years, researchers asked, how can we stop or dissolve the amyloid plaque that gums up the brain’s neurons and brings on dementia? That proved ineffective. Now, they are redefining the question (that is always a good approach when you cannot solve a problem): How come many older people die with their brains gummed up with amyloids, yet they show no sign of dementia????? Answer: Must be the immune system. 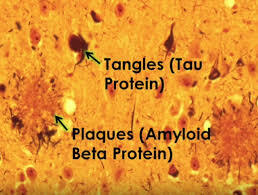 The body has proteins generated by the immune system that protect neurons from being damaged by those amyloids. Sometimes they are effective. Sometimes they are not. Why? Initial results are promising. I wish they had framed this question much earlier. And I’m proud that Israeli researchers appear to be leading the way in this new avenue of research. A leading researcher in the US, Dr. Liddelow, at New York University, reports the new focus “will lead to a rapid production of effective treatments”. I am hopeful that this is true. This, for me, is personal. I and those I love might well need it. So press on, Dr. Liddelow! Donald, sir, I have a problem. How do I explain global warming and climate change to someone like yourself, with the attention span just a bit less than a goldfish ? Who does not read anything, and gets information from Fox News? To someone with untreated attention deficit disorder from childhood ? Here is my best shot. Suppose this next sentence is a Tweet, Donald. Read it as such. I mean no disrespect. 93 per cent of the added heat generated by global warming is absorbed by the oceans; only 7 per cent, by the air. That’s only 23 words. Well within 140 characters. Don’t believe it? Please, look at the graph. OK? 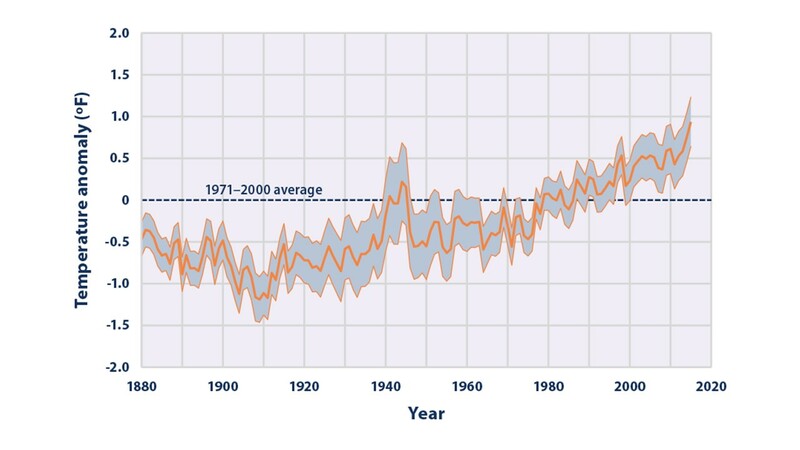 Why is warmer ocean temperature a problem? Why do we care that up to 30% of the Great Barrier Reef has already disappeared, because the coral can’t stand the warmer temperatures? Well, Donald, let’s take your own body. Uh, rephrase that. YOU take your own body. Suppose you are running a temperature. Say, two degrees. Instead of 98.6 F., 100.6 F.? Would you go to a doctor? Feel ill? Take medicine? Well, the ocean is like our human bodies. It is feeling unwell. And it has been running a fever for quite a while. And it is getting worse. Your decision to leave the Paris Agreement made the oceans feel sicker. So while we think global warming is about, say, heat waves, it is really about destroying the ecology of our oceans and melting the ice caps. The oceans are huge heat sinks. And they just don’t like it all, nor do the creatures who live there. Oops. 286 words. Too long. I’ve lost your interest. Can anyone help? Maybe – the Russian spooks you seem to love? A 16 ounce bottle of Coke contains 52 grams of sugar. According to the American Heart Association, men should consume no more than 37.5 grams of sugar daily, total (9 teaspoons) and women, 25 grams (6 teaspoons). The epidemic of Type 2 diabetes must surely be related to the consumption of sugar beverages. One bottle of Coke exceeds the daily limit by nearly half. Guess what! People are beginning to get it. Sugar consumption is down, and with the drop in demand, the price of sugar has plummeted! Good news? Not really. The cheap sugar simply boosts profits of Coke and other beverage companies, and enables them to market aggressively – and deceitfully. Here is a personal example. I attended a Food Innovation conference here in Israel. The keynote speaker was an American food scientist, who presented research “proving” the obesity problem of Americans (one person in three is obese) was not related to sugar foods and drinks but — lack of exercise. Before him, the Coca Cola VP for marketing spoke. Of course, the scientist’s research was funded by …Coke. And so was much of the conference. Few people understand how powerful the sugar lobby is, all over the world, fueled by massive profits. Coke earned $6.5 b. in net income in 2016, down from nearly $10 b. in 2012. Why down? Despite Coke’s efforts, people finally are getting it. But there is a problem – naturally, an economic problem. 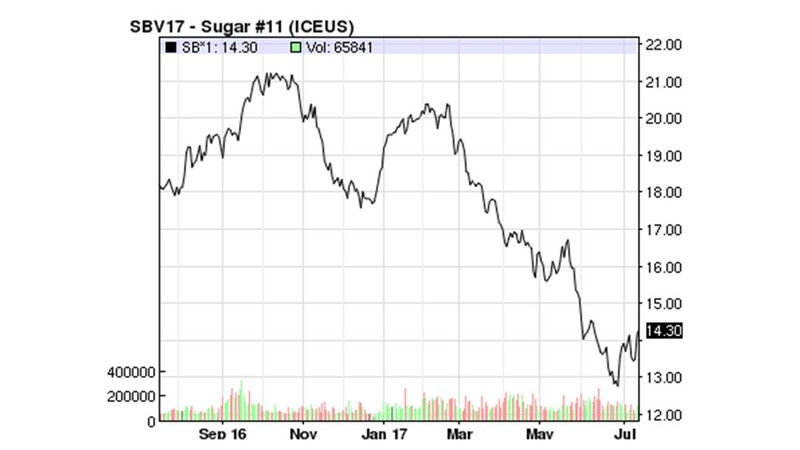 Falling demand for sugar leads to lower prices. The price of sugar has dropped by almost a third since March. Today sugar is ridiculously cheap. And that, of course, encourages even more use of sugar. And generates even higher profits for Coke. (See Graph). Sugar is addictive. The more you eat, the more insulin your body produces to digest it – and the more you crave. Here in Israel, the Ministry of Health has a plan to require food companies to put red labels on foods that have high sugar content. The food lobby has fought this fiercely, and still is. Let’s fight back. Cut back on your sugar. And react with anger at the efforts of high-sugar beverage companies to manipulate you. This is a tough fight – free-market economics means that the less we consume, the cheaper the stuff gets and hence the higher the incentive to use more of it. There has to be a role here for the govt. regulator. If the government pays for the health costs of excess sugar consumption (that means, WE pay for it), then there should be some form of regulation – even a warning label, like tobacco. Why not? Vaccines – Without the Ouch! I regularly listen to Science Friday, a National Public Radio program on WBUR (you can download their app easily). Some 2 million people listen every week. The host Ira Flatow explains complex scientific breakthroughs with a light touch, clear language and a sense of humor. This week’s edition included a segment on a novel pathbreaking way to administer vaccines, without the long needles or the ouch. Scientists at George Teach (Faculty of Chemical and Biomolecular engineering) developed a kind of patch (like the kind used to administer heart medicine) – only this patch has micro-needles, that contain the vaccine, e.g. flu vaccine. You simply slap it on your upper arm….and the micro-needles penetrate the skin and administer the vaccine. 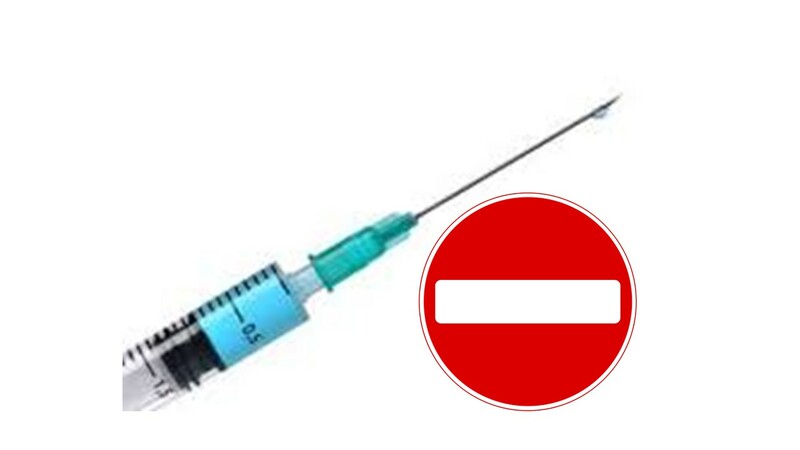 No ouch, no needle, and – most important, no need for a doctor or a trained nurse to administer the needle. You can do it yourself. And you don’t need to refrigerate the patches, either. Once the vaccine has been delivered to the blood stream, the micro-needles, which are water soluble, simply dissolve. You pull off the patch – and discard it. This is a huge breakthrough. Why? Because in poor countries, like Africa, getting vaccine into rural areas, and keeping it refrigerated, then having nurses or doctors administer it – this is a real challenge. These new patches could solve the problem. The Georgia Tech experts say they have tested the flu vaccine’s effectiveness, when administered with the patch, and it is equal to the vaccine injected by needle. What does the patch feel like? Flatow asked. Like….a piece of Velcro on your skin, came the answer. How soon will this be available? Ira Flatow asked. About five years, came the answer. I sure wish they would speed it up! This is a great example, for innovators, of uncovering hidden assumptions and smashing them. Assumption: Vaccines are administered invariably by needles. Right? Always have been. Well, why? Maybe here is another way. I just wonder why it took researchers so long to get rid of those needles, that frighten so many people, including grown men….. and make vaccination so expensive. It’s those insidious hidden assumptions!